A researcher from Athlone Institute of Technology has made meaningful strides in stent technology through her work with polymer and biodegradable medical devices. Originally from China, Dr Yuanyuan Chen has designed breakthrough coronary scaffolding which can be placed in clogged arteries to increase blood flow to the heart. With a background in nursing, Dr Chen is all too aware of the growing incidences of coronary and peripheral artery diseases and of the problems associated with the coronary stent solutions currently on the market. “Most of the coronary stents on the market are permanent and require invasive surgery to fit and can’t be removed. Patients fitted with these stents often experience complications such as an auto-immune response. In dealing with this, they are required to take anti-rejection medications to prevent their bodies from rejecting the coronary stent. These tablets must be taken consistently for the rest of the patients’ life and can have unpleasant side effects,” she said. Some of the largest medical technology companies in the world, including Abbott Vascular, have been attempting to create fully biodegradable stents that be absorbed by the body with the view to minimizing the need for invasive surgery. One such product, made from an expensive material called PLLA, has made it to market but not without complication. For companies like Abbot, stent thickness is still a major issue as their biodegradable stent is double the size of the permanent stents on the market. With smaller medical devices like stents, size is extremely important as tissue is liable to grow around and compress the artery, resulting in a restriction in blood flow. The main difference between the stents Dr Chen is creating and what’s currently on offer commercially, is that hers are made from a stronger, reinforced polymer that enables her to create thinner and more durable biodegradable coronary stents. She’s quick to point out that this revolutionary medical device technology is still in its infancy and not without its challenges. “Absorbable stents are wonderful in theory and have the capacity to revolutionise the world of modern medicine, but the technology hasn’t been perfected. These stents perform an important function and once their job is done, they should break down and be naturally absorbed by the body. Problems arise if they dissolve too early and haven’t fully fulfilled their function,” Dr Chen said. The stents Dr Chen is developing at Athlone Institute of Technology’s Materials Research Institute (MRI) are made from a unique blend of PLA polymer and are extremely cheap to produce. 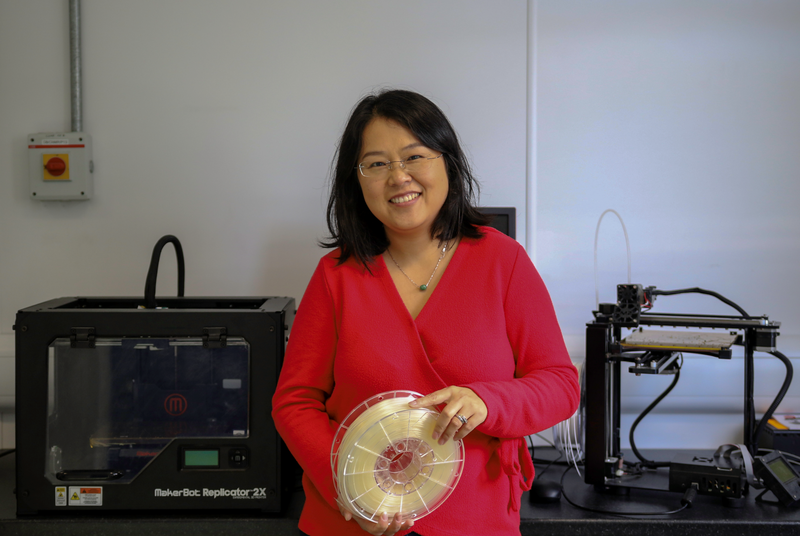 Using a process called Fused Deposition Modelling (FDM), Dr Chen is 3-D printing the coronary stents in-house and testing them constantly to check their biocompatibility. With absorbable stents currently one of the most promising fields in interventional cardiology, Dr Chen’s innovations are particularly pertinent. Her stents are thinner and more durable than others currently on the market, will cost significantly less to produce and will reduce the need for invasive surgeries. In recognition of her significant contribution to the scientific canon, Dr Chen, who recently passed her PhD Viva, was awarded Athlone Institute of Technology’s ‘Women in Research’ award. “I’m extremely honoured to be the first recipient of this inaugural award and I feel it’s indicative of the institute’s commitment to supporting women in STEM and to achieving gender parity in our workforce,” she said. The ‘Women in Research’ award, which consists of a bursary of €37,000, will fund Dr Chen for a year, enabling her to develop new ideas, apply for further research funding and establish herself as an independent researcher within the MRI. “This bursary has given me the breathing space to figure out if I want to pursue a career in industry or academia. I’m really lucky in that the work I’ve been doing here at Athlone Institute of Technology combines both. Without this award, I would have been under pressure to find full-time employment while trying to finish my PhD thesis and related publications. “I’ve received tremendous support from the lecturing and research staff throughout my undergraduate and postgraduate degrees, particularly from my supervisor Dr Declan Devine who has been instrumental in my development as an academic. I was pregnant with my first child during the latter half of my PhD and the team here couldn’t have been more supportive,” she said. As part of its strategy to retain the best and brightest minds, the Material Research Institute has transparent and fair work-life balance policies in place to ensure employees, such as Dr Chen, enjoy a good work-life balance. Employees can avail of flexible working hours if needed, boosting contentment amongst staff and, crucially, productivity. AIT is a member of the Athena Swan Charter and is working toward the bronze Athena Swan award, the goal of which is to achieve gender parity in the workplace, particularly in STEM, where there is a persistent imbalance or 3:1 in favour of men. The Athena SWAN Charter was originally developed in the UK in 2005 by Advance HE to encourage and recognise commitment to advancing the careers of women in science, technology, engineering, maths and medicine (STEMM) employed in higher education and research. Athlone Institute of Technology is a modern and dynamic HEI distinguished by outstanding learner experience, international focus and applied research and innovation. Awarded Sunday Times Institute of Technology of the Year in 2018, AIT is ranked 8th nationally of all HEIs in the league table comprising of Irish Universities and IoT’s. Athlone Institute of Technology boasts a wide array of courses in the Faculties of Engineering and Informatics, Business and Hospitality, and Science and Health. For the full list of courses on offer at Athlone Institute of Technology click here.